The receiver function (RF) technique is an effective method for studying crustal structure. For a single station, the average 1-D crustal structure is usually derived by stacking the radial RFs from all back-azimuths, whereas structural variations (such as dipping discontinuities or anisotropy) can be constrained through analysis of waveform dependence on the back-azimuth of both the radial and tangential RFs. However, it is often difficult to directly extract information about structural variations from the waveform of RF, due to the common presence of noise in real data. In this study, we proposed a new method to derive structural variation information for individual stations by applying principal component analysis (PCA) to RFs sorted by back-azimuth. In this method (termed as RF-PCA), a set of principal components (PCs), which are uncorrelated with each other and reflect different characteristics of the RF data, were extracted and utilized separately to reconstruct new RFs. Synthetic tests show that the first PC of the radial RFs contains the average structural information of the crust beneath the corresponding station, and the second PC of the radial RFs and the first PC of the tangential RFs both reflect the variations of the crustal structure. Our synthetic modeling results indicate that the new RF-PCA method is valid for a variety of synthetic models with intra-crustal dipping discontinuities and/or anisotropy. We applied this method to the real data from a broadband temporary seismic station (s233) in the central part of the Sichuan Basin. The results suggest that the RF data can be best explained by the presence of two nearly parallel dipping discontinuities within the crust. 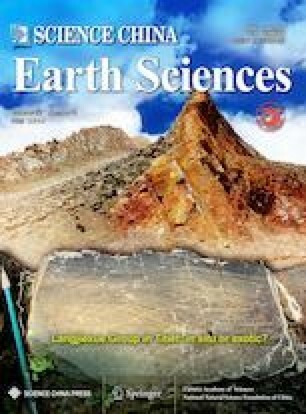 Combining with previous logging data, seismic exploration and deep sounding observations, we interpret the shallow dipping discontinuity as the top boundary of the Precambrian crystalline basement of the Sichuan Basin and the deep one corresponding to the Conrad interface between the upper and lower crust, consistent with the geological feature of the study area. In this work, both synthetic tests and real data application results demonstrate the effectiveness of the RF-PCA method for studying crustal structures. Supplementary material is available for this article at https://doi.org/10.1007/s11430-018-9341-9 and is accessible for authorized users. We acknowledge the participants of the Seismic Array Laboratory of IGGCAS for collecting the data (doi: https://doi.org/10.12129/IGGSL. Data.Observation, https://doi.org/www.seislab.cn/). We thank Prof. Frederiksen and Prof. Bostock for providing the Raysum package and Prof. Qingju Wu for providing the time domain maximum entropy spectral deconvolution algorithm. We thank reviewers for their constructive comments and suggestions, as well as the help of Yiming Bai, Zimu Wu, and Yujing Lai. This project was supported by the National Natural Science Foundation of China (Grant No. 41688103) and the independent project of the State Key Laboratory of the Lithospheric Evolution, IGGCAS (Grant No. SKL-Z201704-11712180).